Fire! Earthquakes! Burning fuses rain! This level is my fifth level on goofans. It was made long time ago and I improved it and published it here. P.S. Fuses has burn time. A whistler will help. This level shows you A NEW LEVEL ENDING WAY and how to create EARTHQUAKES!!! Feel free to use it! Add a new level ending way and move this stuff to sample category! I created this level to point out that explosive Balls can do more than break geometrys. They are also able to push nonstatick geometrys which are not tagged break=1 or break=2. A demonstration on how to make an underwater level. ok so you just made a world of goo level. 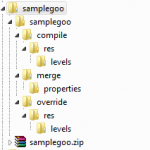 now it is time to make it into a goomod file. first download and extract this samplegoo.zip. This is an example of changing the colors of WoG stuff. You can edit this package by opening it in WinRAR or just by changing the file format from ".goomod" to ".zip"
Please feel free to edit! This is an idea that I had recently. There will be a long line of these things, which you need to activate one by one. Then you need to slide underneath. Hopefully you activated them into a good patten for this. There are some weird strand in this level!